Figure 3-24. Changes in Bolt Velocity Imparted by Blowback and Determination of Time for Unlocking. are used is explained later in connection with plotting the theoretical time-travel and time-velocity curves for the interval before the piston strikes the bolt. 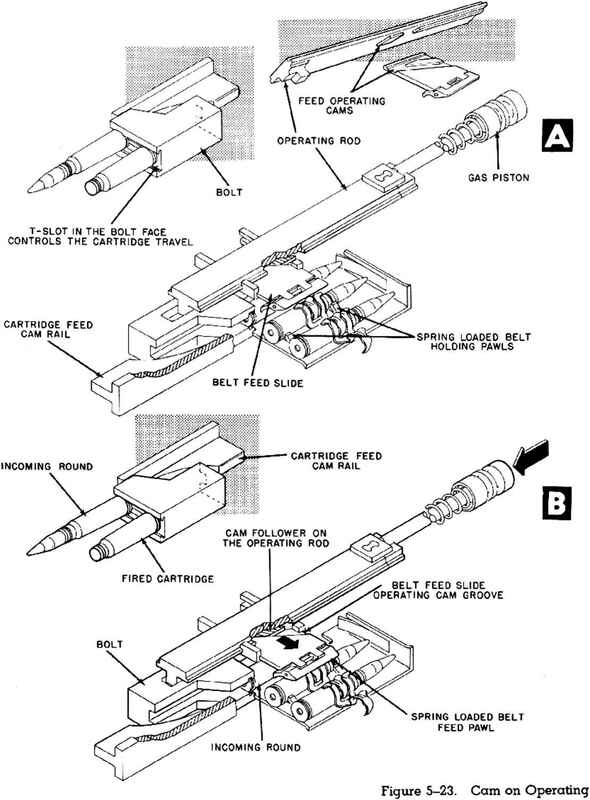 Having determined the free recoil condition, the effect of blowback, and the unlocking time, the next step in the analysis is to select the characteristics of the barrel spring and to determine the counter-recoil velocity possessed by the gun at the instant it is fired just before reaching the battery position (advanced primer ignition). In order to make use of advanced primer ignition it is necessary to sclcct the banrel spring characteristics carefully to insure proper timing of the counter-recoil motion of the gun. If the spring is too strong, the gun will reach the firing position too early and will be stopped by the mechanical buffer before the bolt can return, with the result that the advanced primer ignition effect will be lost. If the spring is too weak, the barrel will return too slowly, thus reducing the rate of fire. Within reasonable limits, however, the choicc of the spring characteristics is not absolutely critical because the timing can be modified slightly by adjusting the length of the recoil movement.